Joseph’s house in the woods. May be one of the first man caves! 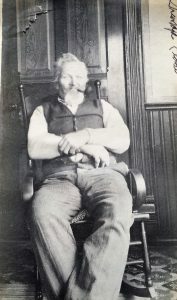 Joseph Cloidt, an old resident of Sollitt and Beecher was born April 3, 1840, at Bergheim, Germany. At the age of 14, in 1854, he immigrated to this country, working for a year in the Pennsylvania coal mines for fifty cents a day. 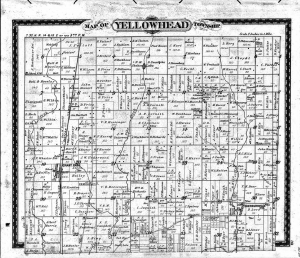 In 1857, he came west and purchased 80 acres of land in Yellowhead Township, Kankakee County. In 1861, at the age of 21, he enlisted in the Civil War, 20th Regiment, Indiana Volunteers, together with his brother. While his brother Anton, as flag-bearer, helped cement the union with his life blood. 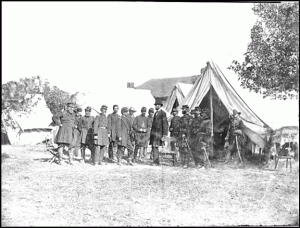 Anton is believed to be buried in Spotsylvania, Virginia. Joseph although taking part in the bloody battles of Bull Run and Gettysburg, was spared. At one time during the war, Joseph enjoyed the distinction of being bodyguard to Abraham Lincoln, for whom he always cherished a very high esteem. 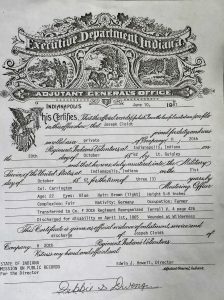 Joseph’s Adjutant General Office Discharge from the Civil War. Enlisted October 20th, 1862. 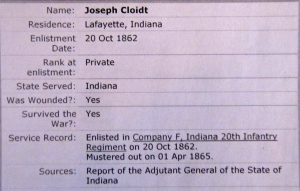 He was listed as Private, Company H, 20th regiment Indiana Volunteers at Indianapolis, Indiana. Transferred to Co. F 20th Regiment Reorganized, Served 3 years, Discharged for disability on April 1st 1865. Wounded at the Battle of the Wilderness. 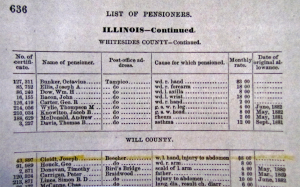 The list of Pensioners below shows w.l. hand, injury to abdomen. Monthly pension was $8.00 a month. 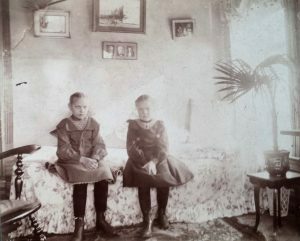 Following the war, in 1865, he returned to Bergheim and was there married to Miss Louise Klein, who gladly accompanied him back to his farm, east of Sollitt. Here their happy union was blessed with seven children, three of whom, one in infancy, preceded him in death. 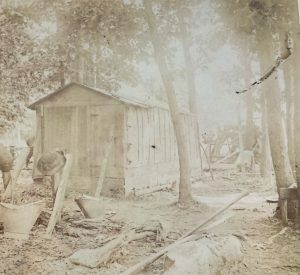 In 1875, he left the farm after adding 200 acres more to the place. 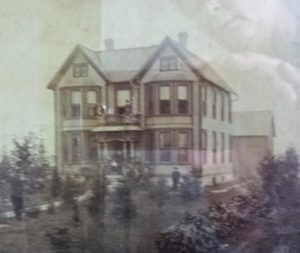 He then moved to Beecher and in connection with Charles Beseke entered the grain trade, in which through his integrity, honesty and fairness, he was signally blessed. In 1878 he bought out his partner and conducted the business alone until 1897, when his son Frederick succeeded him. Frederick built the first grain elevator near the railroad between Penfield and Indiana in Beecher in 1897. 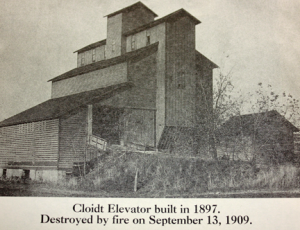 The elevator burned in 1909. Joseph was the owner of 467 acres of land, of which 167 were situated a mile across the Indiana line. Upon his retirement in 1881, he then moved to his beautiful new home at Sollitt and in this quiet, peaceful hamlet, many years of happiness were his until 1915, when his faithful, loving wife and the mother of his children was called by the angel of death, and life for him lost much of the interest and joy afterwards. Joseph’s funeral service was rendered by Rev. G Horst who spoke fittingly to a large gathering of relatives and friends. From the funeral home, the procession motored to Beecher, where the departed was laid to rest in the mausoleum. Here the service was in the hands of the American Legion, who gave him the honor due a veteran. Joseph Cloidt, a veteran of the Civil War and reputed to have been a bodyguard of Abraham Lincoln, died yesterday at the home of his son Fred G. Cloidt, 1410 Park Avenue, Chicago Heights, IL. 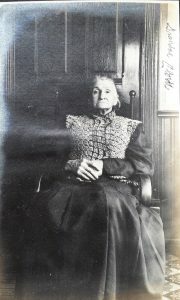 Death was due to a complication of diseases brought on by old age. At 93, Mr. Cloidt was one of the oldest residents of this community. Born in Germany, Mr. Cloidt came to this country at an early age. He enlisted with an Indiana company and was an active participant in the stirring struggles of the war between the states. To his friends and relatives here he used to tell stories about Lincoln and about his service as one of the President’s bodyguards. After the war he settled at Sollitt, where he conducted a grain business. 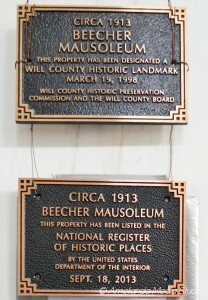 He was also in business in Beecher prior to three years ago, when he came to make his home here with his son. In addition to Fred Cloidt, the survivors in the immediate family include another son, Frank Cloidt, of Grant Park; and two daughters- Mrs. Louise Berg, of Cedar Lake, and Mrs. Mary Engelland, of Waukegan. There are nine grandchildren and fourteen great-grandchildren. 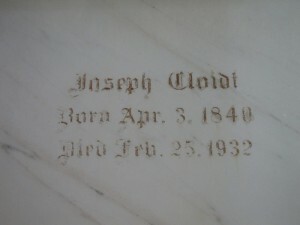 A brother, Anthony Cloidt, was killed in the Civil War. Final rites will be held at 1:30 o’clock Sunday afternoon at the Spindler-Koelling undertaking rooms, with interment at the Beecher cemetery. 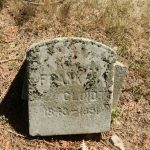 This entry was posted in American Legion, Automated Burial Listing, Burial Listing, Burial Location, Civil War 1861-1865, Freemason (Masonic Lodge), HEADSTONE, Obituaries- Have Full Copy by Sandra. Bookmark the permalink.